Freedom Fair is not just about the fireworks and festivities in Tacoma, but takes on a different – and very mobile – character in Gig Harbor on Saturday, June 30 and Sunday, July 1. The Wings and Wheels Air Show and Car Show, now in its eighth year, continues to bring families, car lovers and aeronautic aficionados to the Tacoma Narrows Airport. More than 200 cars on display range from the exotic to the historic (Sunday only), and dozens of planes are shown on the ground and zooming overhead in spectacular fly-overs. Stunt pilots and live aerobatics provide a feast for the eyes, while food vendors and a beer garden are the feast for the belly. As the only air show in Pierce County, Wings and Wheels doesn’t hold back on the spectacle. You’ll watch a 12,000-horsepower car race an airplane down the runway. 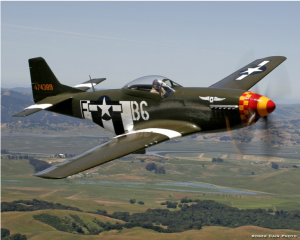 North American P-51D Mustang “Speedball Alice,” known from films and as a regular at air races across the country, will be doing flyovers. Aerobatics from Vicky Benzing, Renny Price and the Juranich Brothers are perennial crowd-pleasers. You can find the entire Wings and Wheels calendar here, along with more information and links to purchase tickets. Tickets will also be available at the door.